Bear photography isn’t just photographing bears. When the grizzlies are salmon fishing they leave carcasses, these carcasses are consumed by other critters. Bald Eagles and Gulls are found pretty much anywhere where the bears feed. Not many would think about shooting the gulls that were at the falls, but Kevin, Dad and myself found them quite entertaining. The bears on day three were not as energetic as hoped. When they weren’t doing anything really intriguing or fun to photograph we would play with the gulls. These two are both Mew Gulls. They are smaller, lighter in color and don’t have the red band as the Glacuous Gull does. Those are the two main gulls we saw at the falls. As you can see the gulls were rather close. Truth be told we were looking down at them most of the time as they would float along the side of the river below the platform eating up guppies. It was quite entertaining to watch as they grabbed up the little green fish. 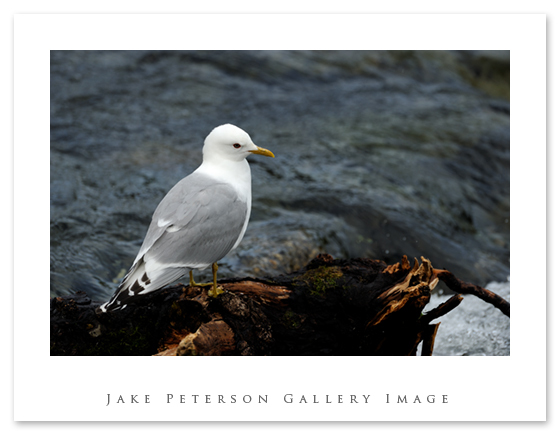 This one Mew Gull kept landing on this fallen log that was above the falls. 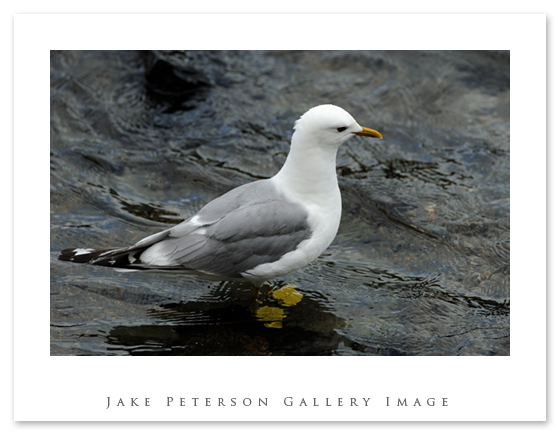 It proved to have nice character when compared to the gull itself. It’s always nice to find other things to shoot when the action is at a lull.